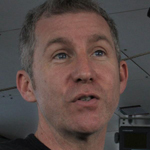 Craig Stevens is a physical oceanographer with a joint appointment between NIWA and the University of Auckland, Physics Department. He trained in engineering at the University of Adelaide before commencing PhD studies supervised by Jörg Imberger at the University of Western Australia. Postdoctoral work at the University of British Columbia with Gregory Lawrence led to a focus on turbulence, stratification and diffusion in extreme environments. This work involves trying to capture the full range of turbulent transfer processes that occur in systems not regularly sampled. These transfer processes tend to dominate most environmental systems and challenge even the best of our computer models. This quest takes him to a variety of locations including floating extensions of Antarctic glaciers, Danish inland seas, the Chatham Rise and most recently a focus on the highly dynamic turbulent flows of Cook Strait.